To use local co-op, simply make sure two controllers are attached and configured, and then start using the second controller. If left alone for ten seconds, Shadow Lenna will despawn again. Since local co-op requires more HUD space in order to display a second health bar, the UI has undergone a minor redesign, which can be seen in the GIF above. A previous update introduced side-quests with rewards that weren’t used for anything at the time. Those rewards can now be made use of in combination with the prince’s power and the new bosses, although the ultimate purpose of doing that is still not implemented. Yes, I’m being deliberately obtuse—it’s super spoilery! The game makes better use of the overworld now. Exploration is encouraged in order to find ventricles and atria (heart pieces), as well as meteorite chunks. Additionally, meteorite chunks can now be used for a wider variety of equipment and item storage upgrades. And finally, all caves are guaranteed to contain items that contribute towards a permanent equipment / stat / companion upgrade of some sort. The update also includes dozens of bug fixes, smaller features and polish items. Implement the remaining four dungeon bosses. Implement the four final bosses, and the three story endings. Complete our GBA-like graphical mode. 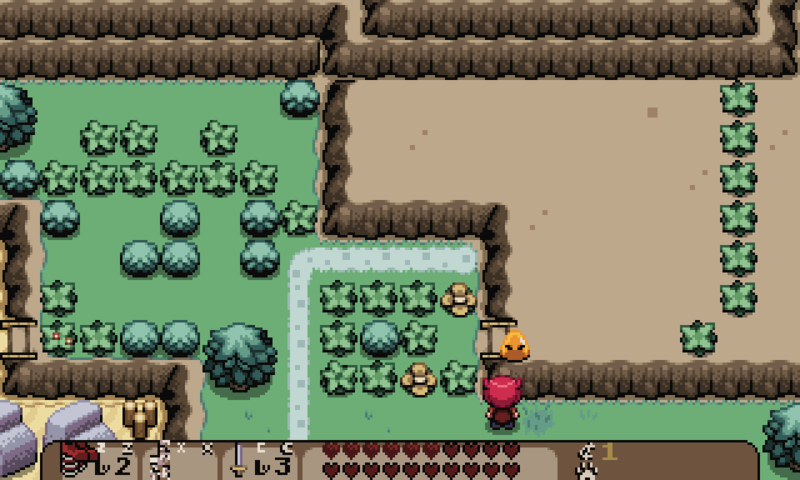 Implement Shadow Lenna's introduction at the beginning of the game. Tweak the dialogue in a few places, to flow more naturally and include more jokes. Add more polish and secrets!